California girl Kacie Miller might work in a metaphysical book store, but she doesn't believe in magic.... until she's sucked through an antique mirror and lands in a dark alley and is rescued by a mercenary who insists she's a powerful sorceress..... Yeah. Right. 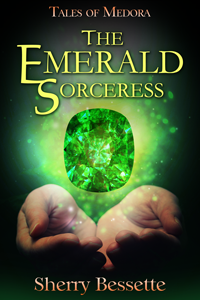 Born in the shadow of the empty Emerald Palace and raised on its legends, Kerric Rouse knows the green-eyed young woman who drops in his lap, hurt and disoriented, is destined to become the next Emerald Sorceress.....If she lives long enough. Copyright 2015 Sherry Bessette. All rights reserved.